1. Preheat the oven to 190°C, gas mark 5. Slash each chicken breast 3-4 times, place into a small roasting tin with half the oil and the zest of the lemon. Season and toss well. Roast for 5 minutes. 2. Halve the radishes lengthways, reserving the leaves. Add to the tin and cook for a further 20-25 minutes, until the chicken is cooked through with no pink meat. Toss with the remaining oil, juice of half the lemon and reserved leaves until wilted. Season. 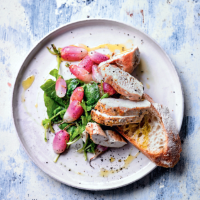 Slice the chicken, place on top of the radishes and serve with the bread.